I am beginning a series of articles highlighting products, applications, and news that reflect openness or freedom in technology. The series on “Lesser Known Applications for Linux” will also continue. Both series should start seeing a regular release cycle soon, as I settle into the hours of my new job and family time. This series begins with the sounds of DRM-free music drifting in the late September air. Recently, Amazon began offering DRM-free (no digital rights management restrictions) MP3 music downloads on its Amazon MP3 Beta site. Here is my review as it pertains to Linux users. Digital Rights Management as currently applied provides nothing but restrictions. It is meant to combat piracy which is a good thing. But as currently applied in one of its many formats, it tends to restrict the consumer to having to purchase additional copies of songs to legally copy and play on the multitude of devices he or she has. Amazon takes a DRM-free approach. Songs from Amazon MP3 can be played on any MP3-capable device, including iPods™, Zunes™, Zens™, iPhones™, RAZRs™, and BlackBerrys™. Our files are free of digital rights management (DRM) software, so you can burn your songs to CDs, play them on all your computers, and transfer them to all your devices. Songs are encoded at 256 kbps, which means you get high audio quality at a manageable file size. I have read an article on the web stating that now Linux users can legally download music. I bristled at the implication that Linux users are pirates. The majority of the people I know use Windows. Of this majority, there is a fair number of individuals who illegally download their favorite music via Limewire, Bittorrent, and other file sharing applications for use on their computers, MP3 players, cellphones, and CD players. As a Linux user, I can attest that I do not pirate music or movies. I respect the rights of recording artists, actors, directors, producers, etc. to be compensated for their work. As a writer, I hope to be compensated fairly for any article, screenplay, or novel of mine that is published. The end result is the product. The product includes the labor it took to create it, build it, write it. As much as I would like to simply pay for auto parts when I need a vehicle repaired, I most often have to pay for the labor costs, too. DRM may have never come into existence had people respected the works of the artists. It came about as a necessary evil, but it also being applied in as greedy a manner. DRM-free music recognizes that the people who buy downloadable music are consumers. That is in itself a step in the right direction. It is a show of respect. While lack of DRM-protected (perhaps DRM-infected is a better way of putting it) music results in fewer music labels willing to offer music downloads on Amazon, there is an impressive list of major artists available. For example, if I search for some of my favorites, I find some interesting results. Not surprisingly, there is nothing available by the Beatles. There is also nothing offered for George Harrison, the Traveling Wilburys, or the Who. Ringo Starr, Paul McCartney and even Wings have downloads available. Songs by John Lennon are available, too. Radiohead is offered. Berkley Hart, an underrated acoustic duo, has every track of every album listed. Not offered is Wilco. The same for John Mellencamp. Indigenous’ earliest albums are listed, but nothing beginning with the group’s self-titled album in 2003 and continuing into the current lineup which only features Mato Nanji of the original band. Nanji should go solo or bring back the original lineup, but that is a blog post for another time. Searching for one’s favorite songs from the 2,000,000 plus available can indicate if Amazon MP3 provides enough to obtain one’s business. It has mine. Hopefully more labels come aboard when their management recognizes DRM-free music is not evil. Nor are music consumers. If you use Linux, you can currently buy individual songs. 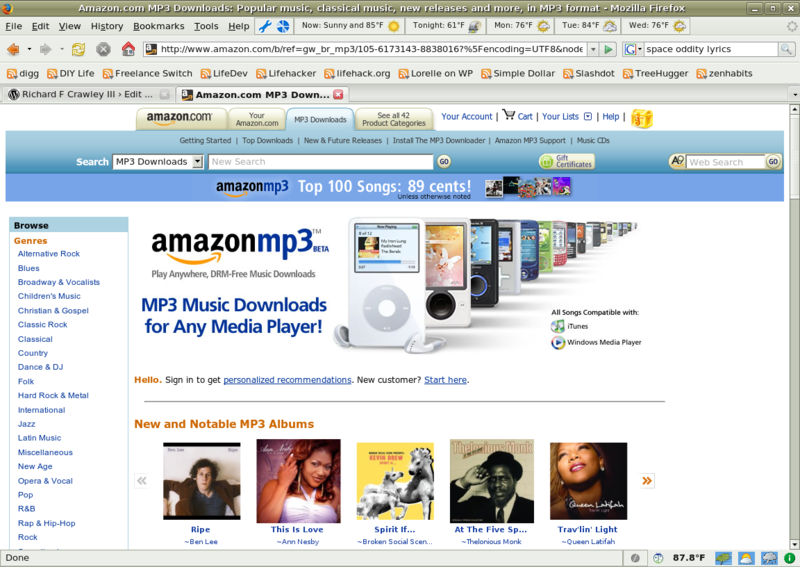 A Linux version of the Amazon MP3 Downloader is under development, and when released will allow entire album purchases. I see this as further proof of the growing use of Linux among desktop users. Vendors, hardware manufacturers, software developers, and computer makers are recognizing the value and benefits of the Linux operating system. A couple of years ago, it is likely Linux users would have been ignored. In a way they still have been ignored by Amazon not having the album downloader available for Linux users upon the opening of the MP3 site. To thank Amazon for making MP3 downloads available to Linux users and to spur them along toward quickly finishing the album downloader for Linux users, email them. Hopefully, Amazon has the downloader available to Linux users before Christmas. It would be nice to purchase some music for my daughter’s MP3 player or my wife’s computer. I decided to give Amazon MP3 a try. My wife has been turning up the radio or computer speakers whenever the Reba McEntire and Kelly Clarkson duet, “Because of You,” plays on a station. She loves that song. After a quick search for Reba McEntire at Amazon MP3, I located it and bought it with no problem in Linux. I placed it in our music library on one of our computers and she listens to it across our home network. I also copied it to her computer to create a backup, in case the music library computer loses a hard drive. I also spied a song that I have always wanted, but did not feel the urge to buy an entire album to obtain. David Bowie’s “Space Oddity” now orbits my hard drive as Bowie sings hauntingly of being lost in space. The whole thing is about as expensive and as painless as when my mother bought 45s of the Beatles music in the 1960s. Of course she received two songs (or four songs if it was an EP) and I receive one song for approximately the same price. The price of an album download is also about twice as much as an LP costs for her. As far as purchasing goes, she has the memories of wandering the record displays on a Saturday afternoon, leafing through 45s and LPs, and rushing home with a new record to share it for the first time with family and friends crowding around a turntable. I used to enjoy that experience when records were still available in the 1980s. Now I have the cold, isolated experience of searching for a song on a website late at night, downloading it, and playing it on my computer for only my listening enjoyment while my family sleeps. I prefer my mother’s experience and the one I used to enjoy. Technology, while it benefits society, tends to remove the social experiences of life. Much like DRM. I did… repeatedly… and still several months after the “launch” there’s still not a Linux version of the Album mp3 downloader.